Shrimp and Scallop Newburg, Thyme for Cooking gourmet main course. This is a lovely dish made with almost any shellfish or seafood. For a party presentation it can be served in Puff Pastry shells. I served it on fragrant Basmati rice. If any of the scallops are huge, cut them in half. Finely chop shallots and mince garlic (see techniques). Heat oil in medium nonstick skillet over medium heat. Add shallots, mushrooms, garlic and sauté 7 - 10 minutes or until just starting to brown. In the same skillet, but over medium-high heat, sauté shrimp and scallops until done, 3 - 5 minutes: shrimp curl up and both shrimp and scallops become opaque (white). 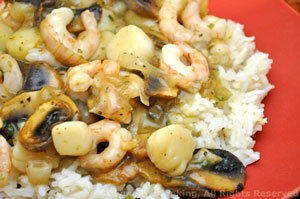 Remove shrimp and scallops to plate with mushrooms and cover to keep warm. Add chicken stock and herbs to pan and bring to a boil. When stock is boiling add cornstarch/sherry to pan and stir constantly until thickened. Return shrimp, scallops, mushrooms, etc. to pan. Stir to coat well and heat through. Add stock and chives, cover and cook rice for length of time on package. When done fluff with a fork. Spoon Basmati rice onto a small platter. Make a well in the center. Spoon the Newburg into the center of the rice and serve.